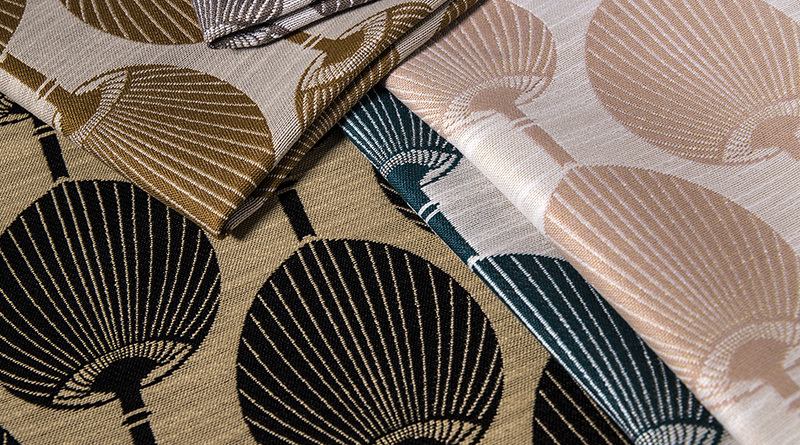 Valley Forge Fabrics, the largest supplier of decorative performance fabrics for the hospitality design sector, announces the launch of its Florence Broadhurst textiles collection with four distinctive patterns from one of the most influential post-war designers. Earlier this year, Valley Forge Fabrics inked a licensing deal to become the first U.S.-based licensee distributing the new collection of textiles globally, with Signature Design Archives, owner of the Florence Broadhurst archive of over 500 patterns. Four signature Florence Broadhurst patterns on fabric are selected for release by Valley Forge this year: Fingers, Steps, Kabuki, and Pomegranates. Each is constructed specifically for hospitality use, in durable upholstery weight or a lighter drapery weight, for use in hotel and resort interiors, and more. To create the collection, Valley Forge remained faithful to the unconventional aesthetics that earned Florence Broadhurst her reputation as a bold designer, such as larger than typical pattern sizes and a healthy dose of strong colors. The new fabric collection includes wovens, prints, embroideries and other specialty constructions engineered for hospitality contract use. Through the careful selection of weaving techniques, yarns, and pattern consideration, Valley Forge is able to bring the vision and splendor of Florence Broadhurst designs to the hospitality industry. Valley Forge Fabrics, Inc. is an over 40-year old family owned and operated company and the world’s largest supplier of custom made and running line performance products for the hospitality industry. Valley Forge specializes in: decorative textiles for upholstery, vinyl, blackouts, drapery, and sheers, digital textile prints, fabricated bedding, custom window treatments & services, and more. For more information on Valley Forge Fabrics, visit the website www.valleyforge.com.